Department of Accounting, Gyeongsang national university, GSNU, Jinju, South Korea. Received August 15th, 2010; revised September 29th, 2010; accepted November 3rd, 2010. 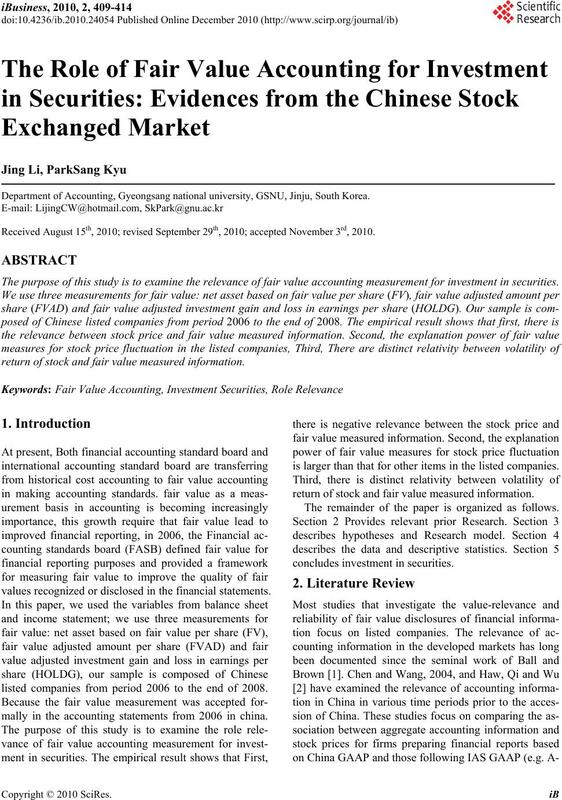 The purpose of this study is to examine the relevance of fair value accounting measurement for investment in securities. 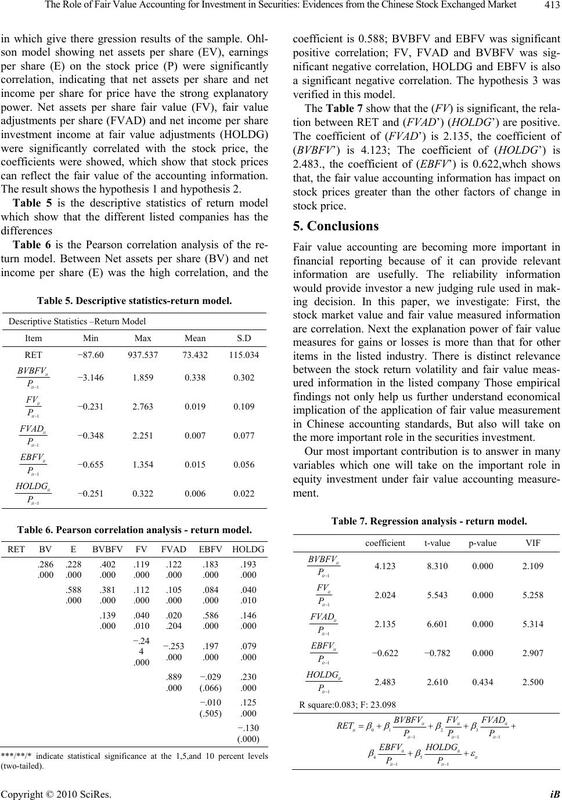 return of stock and fair value measured information. values recognized or disclosed in the financial statements. listed companies from period 2006 to the end of 2008.
mally in the accounting statements from 2006 in china. is larger than that for other items in the listed companies. The remainder of the paper is organized as follows. this setting is not hindered by reliability concerns. auditing standards that should reliability. understand its implications for future earnings. should be considered by standard setters. and real earnings of the enterprise . bility of management that fulfills the economic situation. information on the performance of present and future. value of assets in an active market is the market price. Thus, we propose the following two hypotheses. value measures disclosed in the financial statements. We use two models to test the hypothesis in this paper. per share at t year. RET Is the firm I’s rate of return at T time period. we used the value is basis on per shares. measurement for investment in securities. Table 2. The sample descriptive statistics. Table 3. 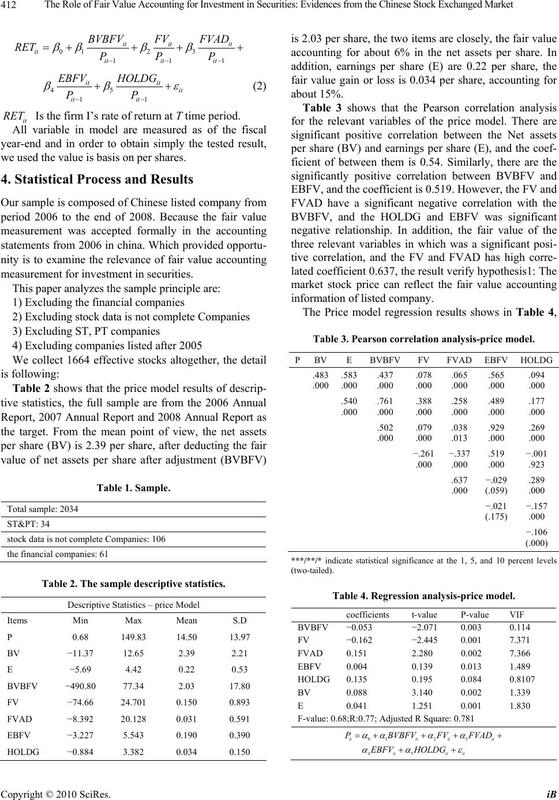 Pearson correlation analysis-price model. Table 4. Regression analysis-price model. 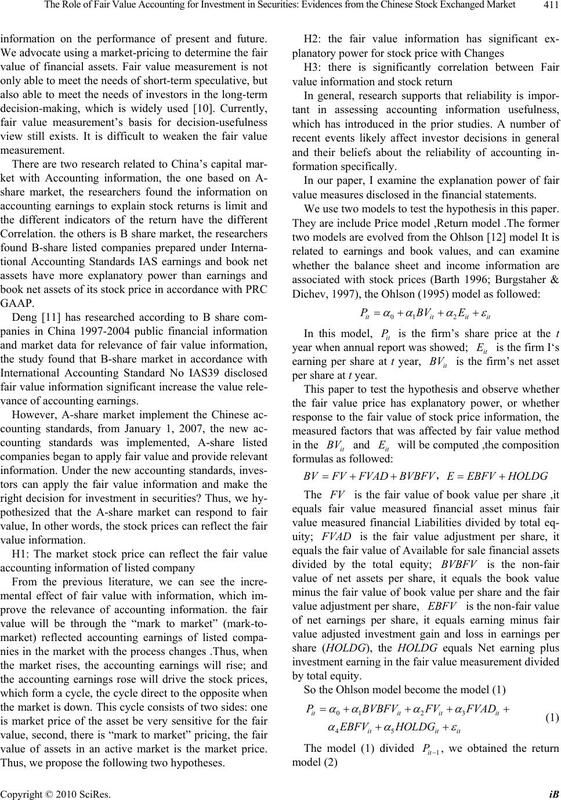 can reflect the fair value of the accounting information. The result shows the hypothesis 1 and hypothesis 2. Table 5. Descriptive statistics-return model. Table 6. Pearson correlation analysis - return model. tion between RET and (FVAD’) (HOLDG’) are positive. the more important role in the securities investment. Table 7. Regression analysis - return model. 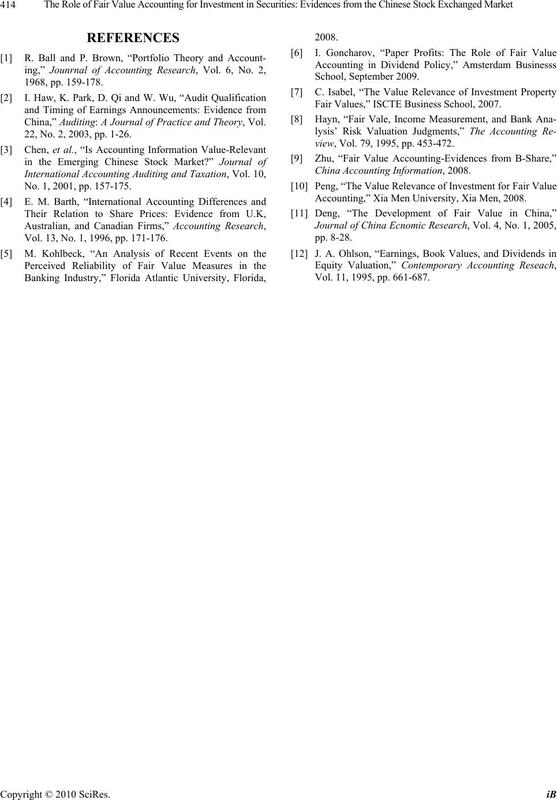 China,” Auditing: A Journal of Practice and Theory, Vol. 22, No. 2, 2003, pp. 1-26. No. 1, 2001, pp. 157-175. Vol. 13, No. 1, 1996, pp. 171-176. 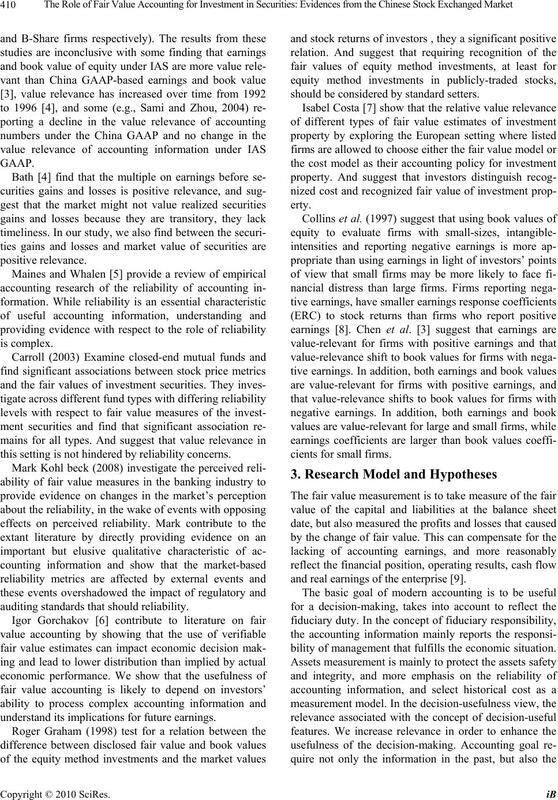 Fair Values,” ISCTE Business School, 2007.
view, Vol. 79, 1995, pp. 453-472. Accounting,” Xia Men University, Xia Men, 2008. Vol. 11, 1995, pp. 661-687.